I still can't decide if I like these muffins or not: rich, chocolatey, surprisingly soft and moist for a vegan baked good. But they just weren't quite what I was hoping for. For starters, they aren't nearly sweet enough. This might be okay for some people, but like I said, I was definitely expecting more. The recipe has some interesting sweeteners and overall ingredients: brown rice syrup or maple syrup (I used a combination of both) is all that's added for sweetness, although there's a bit of tangy-sweet rice wine vinegar as well. Who thought to put rice wine vinegar in chocolate muffins I have no idea...it isn't much, but I think some of the tanginess does come through. Brown rice syrup also isn't terribly sweet and is actually sort of salty, so the overall muffin has a weird salty-sweet flavor. The only other sweetness that comes through is the chocolate chips, which are interestingly enough listed as optional. I used semisweet chips, and I'm sure milk chocolate (although not vegan) would have turned these muffins up a notch. Brewed coffee (the main wet ingredient) just deepens the chocolate flavor, thus another obstacle in the path to sweetness. What I DO like about these muffins is the added almond extract, which gives a nice fragrant, almost tangy aroma and flavor. 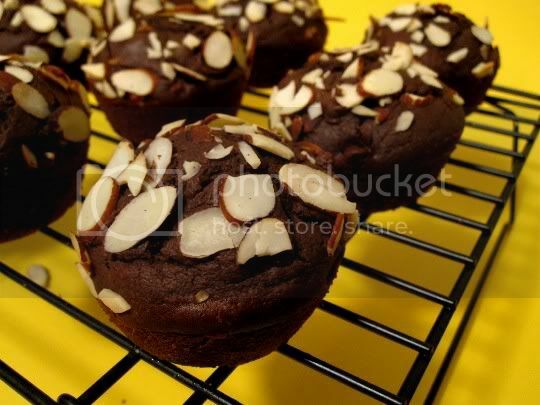 Sliced almonds added on top give a nice crunch to the very smooth and fluffy muffin texture. Make again? Eh, probably not.